This is about to change-well, a bit. 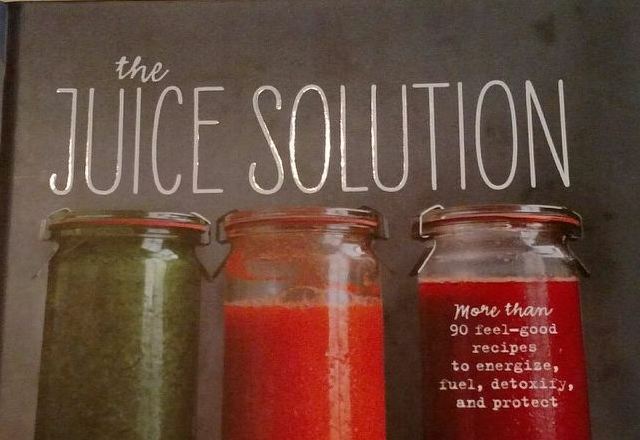 After looking through the book The Juice Solution with my cousin JoDe, we both got excited to try a few. I thought I would substitute one or two of my ice cream nights for a delicious juice. Why not try something sweet that also packs in a vitamin punch? Peel the lemon. Cut the lemon, apples, cucumber and beet to fit the juicer. Place the lemon, apples cucumber, beet, ginger and celery into the feeder of a juice extractor and run the machine. Makes about 2 cups. Personally, I might also try just putting all of the ingredients in a blender and see which I like better. We are going to write what we think of each recipe we try in the upcoming weeks. Join us and write your thoughts as well. Hopefully we will find the most liked recipe and perhaps it will be the new girl’s night drink of choice…wouldn’t that be something? Spicy! I may have put a bit more than a knob of ginger in mine, but wowzers! I could only sip it at first and then my taste buds became used to the concoction. The fact that it had a completely unexpected taste or zing made it kinda fun though…happy tasting everyone. 🙂 I can’t wait to see what other people think. I thought it was good even though the ginger was strong. I also ran a batch through with celery, again using cheesecloth because I don’t have a juicer. I liked the kale batch best but the celery batch was good and very drinkable. 😀 My daughter dislikes beets and didn’t like either batch. I’m an avid smoothie drinker, so I LOVE trying some new recipes. Ready for the next one! I loved this! Having been warned the ginger came thru strong, I only used about an inch, and it was amazing!! I used the celery and loved the slight saltiness wih the bite of the ginger. I’ll be doing this one again real soon!